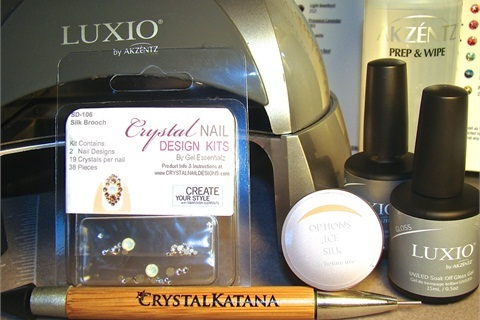 Gina Silvestro shows how to use a new Swarovski Crystal Nail Design Kit to create a stunning embellished look. Nail tech Gina Silvestro is the first ever "create your style" Swarovski Elements ambassador who focuses exclusively on nails. She offers convenient Crystal Nail Design Kits of prepackaged gems, which include a salon menu wtih suggested pricing, making it easy for techs to offer the service at a profit. The xilion rose-enhanced cut of Swarovski's flat black crystals means an optimized table size that results in distinctive brilliance, outstanding reflectivity, and intense color, according to the manufacturer. 1. Apply a layer of Akzentz Luxio Base gel. 2. Cure for 30 seconds in an LED lamp or two minutes in a UV lamp. 3. Apply and cure your final coat of color, glitter, and/or design. 4. Apply a layer of Akzentz Luxio Gloss to the design area, DO NOT cure. 5. For large designs and/or larger crystals, place only the large stones first, then cure. 7. Place smaller surrounding crystals into the wet/uncured gel according to design image. 8. Using the chrome end of a Crystal Katana, gently adjust the placement of the crystals. Cure. 9. 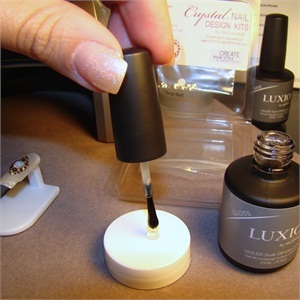 For better adhesion, place a drop of Akzentz Luxio Gloss on a palette, and dip a small liner brush into it. 10. Place small drops of Gloss between the stones, creating “prongs” out of the gel to secure the crystals. Cure. 11. Run Gloss around the edges of the crystals with the the liner once more. Cure. Cleanse the nail of the tacky layer using Akzentz Prep & Wipe. Here's a look at the finished nail. 1. Place a cotton ball soaked in acetone/ soak-off solution over the Swarovski crystals. 2. Wrap the fingertip with a small piece of aluminum foil. 3. Allow eight to 10 minutes for the solvent to penetrate and soften the Luxio Soak Off Gel. 4. Using a tweezer or pusher, gently remove the crystals. Clients may keep the crystals that have been removed for another use. For more information, visit www.crystalnaildesigns.com.